Not everything is clear under the bright lights in the world of casinos. There are some things that are kept as secrets. To that end, it’s in the average player’s best interest to learn more about these secrets. We hope that you will learn some useful information from some of the paragraphs below. Different games have different payout rates. Okay, this isn’t really a secret if you put it that way. It’s a well-known fact that casino games have different payouts. 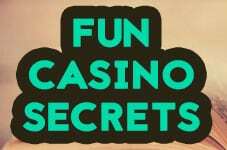 But the secret here is that some games are outright stacked in the favor of the casino. Games to avoid in this sense are Caribbean Stud Poker and Double Exposure Blackjack. Don’t play these games as the casino has a big edge over the player. Also, slot games (both physical and online) have different RTPs so to take a look at this before can be pretty fun. Security is paramount in casinos. You may not see it, but the watchful eye of security is always present at real casinos. There are many security cameras that operate all the time. So, if you have the intention to cheat, think again. If you make a big win on some game then security will check through the camera recordings. They do this in order to check if the winner has cheated. The difference between roulette games. American roulette has a somewhat bigger edge for the house when compared with European and French roulette. This is due to the fact that there is a double zero in American roulette. So, if you have the option to pick – always make sure to play the non-American versions of the game. You should now be aware of the fact that not everything is straightforward when it comes to casinos. There are many other secrets in the world of gambling. It may be useful for you to do some research on the subject on your own.